This comes as a complete surprise to all the Indians who were never aware of this fact. India has won not one but "Two" Gold medals in the Beijing Olympics 2008 Games. The person who managed to achieve this is Sunita Lamba, the sister of the late cricketer, Raman Lamba. 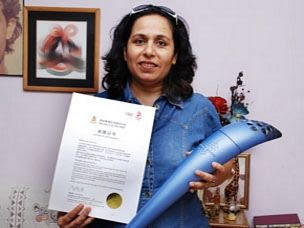 She is a fine arts artist from the capital Delhi, who sent her sculpture, called "Spirit of Unity" for the Olympics fine arts 2008 exhibition, put up by the organization committee at Beijing. 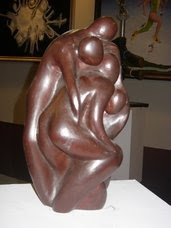 Her sculpture was selected for the display and she was awarded a Gold medal for the same. She was declared as the "best artist" at the exhibition. "To find a place in the Olympics Fine Arts was a cut throat competition, where 10,000 artists from 80 countries participated. But the paintings and sculptures of only 110 artists were selected for exhibition in the gallery of Olympics Fine Arts 2008," Sunita said, in an exclusive interview with Headlines India. She has received a certificate of the Gold medal from the Beijing authorities and along with that she has also been given an Olympic torch. The art exhibition will run for a few months in different parts of China and also move to countries across the world. This is truly a "very" proud moment for India and Sunita Lamba. Now, Abhinav Bindra will have to share his spot with Sunita Lamba who got us the Second Gold medal in the Beijing Olympics medal Tally in 2008. The questions now that need to be asked are: Why was her achievement ignored thus? Why was her Gold medal not given any recognition, despite the fact that she had tried to contact Indian Olympic Association President Suresh Kalmadi and Union Culture minister Ambika Soni to tell them about her participation. Sunita has had to plead the government authorities to recognise her achievements.